The CNM Informatics subunit was formed in 2007. Nutrition Informatics is the intersection of nutrition, information, and technology. The purpose of the subunit is to support member education about the topic of food and nutrition informatics, promote nutrition informatics, and keep CNM members aware of the activities of the Academy’s Nutrition Informatics Committee. Clinical nutrition managers are actively engaged in the integration, transition and redesign of food and nutrition service and care processes for the electronic world. Patient care documentation, physician order entry, diet order taxonomy, quality audits, outcomes data, computerized patient menu processes and staff competency are among the many topics within the scope of food and nutrition informatics. Increased knowledge and understanding is needed so clinical nutrition managers are better able to strategize, communicate and integrate dietetics with the health care environment. 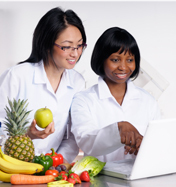 The Food and Nutrition Informatics Sub-unit provides an opportunity for members to share information about nutrition software and informatics issues as related to management of clinical nutrition departments. Become a member of the Informatics Sub-unit by linking to the Informatics sub-unit Member Info. The CNM member directory allows members to indicate areas of expertise related to informatics. Specific products used for Electronic Health Records and Food & Nutrition software can be indicated and allow CNM members to share with others who have the same system.